Still Frame Capture from Todd Standing Video. First, let me be very clear this is NOT a photo that was taken by Todd Standing. According to his video, it was sent to him and he has been invited to the area. While I did not watch all of Standing's video, I will link it below, I watched enough to get a little of the brief story he told. That being,the photo was submitted to him and he is invited to this area to view Sasquatch. 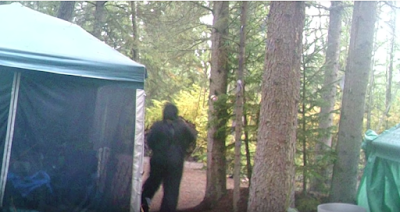 As most of you probably know, Standing released a documentary entitled Discovering Bigfoot back several months ago. It, for the most part, has been met with good reviews, although their are many who dispute the documentary and his evidence. Below is the link to his video, with the above picture, followed by some close up of the figure in the picture, along with some thoughts about it. Now more about the photo. To me this is so obvious that it is a suit. 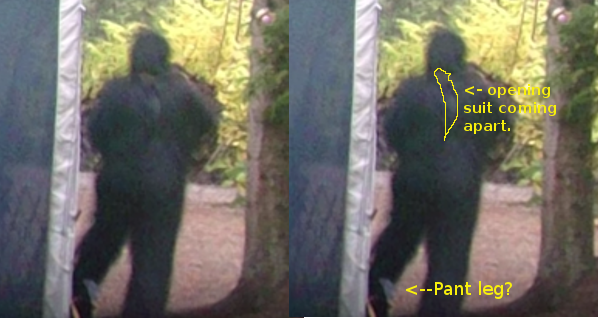 You can see what appears to be a pant leg and maybe even black shoes. If you notice the back of the figure, it appears that the suit is coming apart. These normally zip up but some of the cheaper ones use Velcro. If you also notice right below the back of the neck there is an opening, this would indicate a pull over mask in my opinion. Also to be fair Standing states he has concerns about the photo but does not call it a fake or hoax. Here is a side by side of the image and the red flags. My opinion is that this is clearly a hoaxed photograph and has too many red flags to be taken seriously. But maybe I'm wrong. I'm sure Standing's fans will be waiting for him to visit the area and then make more comments about the photograph. In the end, I guess you can make up your own mind. So, there you have it and feel free to share your opinion in the comments about the photo. It looks like a man called Jebediah from Indiana. 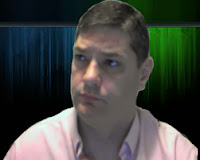 I know I should be more professional Thomas but the the Frik is he thinking. ha ha...yeah it is a clear fake ..I think he is presenting it to just get some press .